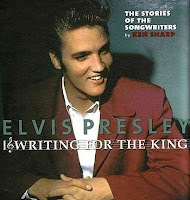 Earlier this week I became the owner of Writing For The King by Ken Sharp, published in 2006. I've been thinking of ordering this FTD book for a long time, but financial reasons have stood in the way. Until now. The book has the subheading The Stories of The Songwriters, and features over 140 interviews with people whose work was recorded by Elvis. It's a big book, about 400 pages, and comes together with two CD's, one with various artist's demos, and the other including unreleased live versions by Elvis from 1969-72. There's been some criticism levelled at this book, and having spent a couple of days with it I have to agree with most of what has been said. For example, there's no song index in the back of the book, so if you want to know who wrote a certain song, you have to search through the interviews that are presented in a more or less chronological order, to see if the song is included and who wrote it. I also find it troubling that Ken Sharp doesn't mention how or when the interviews were done. Some of them also take up more space than necessary, Burt Bacharach who wrote "Any Day Now" doesn't even mention Elvis, and Paul McCartney only talks about Elvis in general terms, not about what he thinks of Elvis' versions of his songs. Mitch Leigh who penned "The Impossible Dream" admits that he had no idea Elvis recorded the song: "I'd like to hear it one day." But despite its flaws, the book still deserves your time, as it contains a lot of interesting and entertaining stories. I especially enjoy to read about the lesser known songwriters, who more often than not were the one's who came up with the songs for Elvis' movies. It's interesting reading how much it meant to have Elvis record their songs and how proud they still are. My favourite interview is the one with Randy Starr, a dentist who started writing songs and had 11 of them recorded by Elvis. "Kissin' Cousins'" was the biggest hit he had with Elvis, but he also wrote "Adam And Evil," "Almost In Love," "Carny Town," "Could I Fall In Love," "Datin'," "Look Out, Broadway," "Old MacDonald," "The Girl I Never Loved," "Who Needs Money?" and Yellow Rose Of Texas." "So far no one has noticed that "Almost In Love" was on the back of Presley's original single, ["A Little Less Conversation"] but naturally I wish someone would do something to rework my song too and make it a hit all over again!" This is becoming a long post, but after all it's a big book, so I hope you forgive me. Before I sign off I have to say something about the CD's I mentioned earlier that come together with the book. The one with the demos I found fascinating, although after a while I want to listen to Elvis as he gives them a try. So why the second CD doesn't include the same songs in the form of unreleased takes done by Elvis, instead of a Las Vegas compilation, is beyond me. Writing for the King was one of my FTD splurges last year. I put off buying it for awhile, too. I actually bought it just to get that Vegas CD because I particularly enjoy collecting Elvis' 1969 and 1970 live performances. I was pleasantly surprised to find that I ended up loving the actual book - which wasn't even why I bought it. I agree, it definitely needs an index of songs. It also needs an index of songwriters. The Table of Contents for such a large book is not very useful to find a specific writer, since they are not presented alphabetically. It could probably use a more general index as well. While I bought the book just to get that Vegas CD, I actually agree that it seems out of place. A CD of first takes (or at least the first complete takes) of the Elvis versions would have made more sense. And now the end is near? "Was this really true or just a dream?" Return of "The Original Elvis Tribute"
Soundboards - where do they come from?